Philippine low-cost carrier Cebu Pacific Air is planning further domestic expansion in 2014 using a combination of organic growth and flights operated by its newly acquired subsidiary Tigerair Philippines. The expansion could see the group’s share of the Philippine domestic market, which in 2013 reached 50% for the first time, approach 60%. Cebu Pacific expects to grow domestic capacity by 9% in 2014, roughly matching the growth from 2013. The expansion comes despite Cebu Pacific reducing the size of its narrowbody fleet as a result of the anticipated transfer of four A320 family aircraft to Tigerair Philippines. Under Cebu Pacific, Tigerair Philippines will remain a separate operation but will return its current fleet of five aircraft to the Tigerair Group. Cebu Pacific will further build on its already leading 50% share of the market as it takes over Tigerair’s 5% share while also continuing to expand the Cebu Pacific operation. But the share of the market it will ultimately secure in 2014 will partially hinge on the response of its two remaining competitors, the Philippine Airlines (PAL) and AirAsia groups. Over the past year Cebu Pacific has already been able to significantly grow its share of the Philippine domestic market as it has expanded rapidly while the overall market has remained flat. In 3Q2013 Cebu Pacific captured 51% of the Philippine domestic market compared to 44% in 3Q2012. In the first nine months of 2013, Cebu Pacific also captured a 51% share of the market compared to 45% for the same period of 2012, according to Philippines Civil Aeronautics Board data. The growth in market share came as Cebu Pacific recorded an 11% increase in domestic passenger traffic for the nine month period, including 21% in 3Q2013. Domestic ASKs were up 19% in 9M2013, including 9% in 3Q2013, while RPKs were up 21% in 9M2013 and 12% in 3Q2013. PAL Group’s share of domestic passenger traffic in the first nine months of 2013 slipped by 9ppts from 43% to 34%, driven by a 36% drop in traffic at PAL and an 8% decrease at PAL Express. The drop at the PAL Group follows an adjustment in strategy that was implemented in late 2012 and resulted in PAL handing over regional routes to PAL Express while PAL Express pulled off most trunk routes. Zest Air, which is now under the AirAsia banner, also saw its market share drop slightly as traffic was down 5% over the first nine months of 2013. Traffic at much smaller sister carrier Philippines AirAsia was also down by 11%. 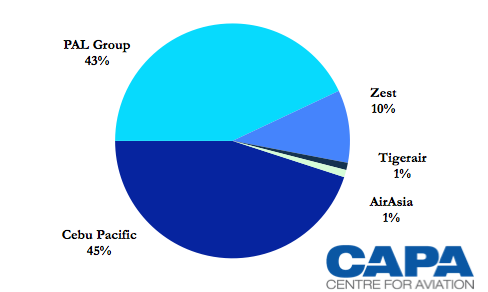 Combined the two carriers give AirAsia a 10% share of the market. Tigerair’s share increased to 5% as domestic passenger traffic increased six-fold but from a very small base. Tigerair Philippines, formerly known as SEAir, only began competing on domestic trunk routes in mid-2012. Note: PAL Group figures include PAL and PAL Express, formerly known as AirPhil Express. AirAsia figures include AirAsia Zest and Philippines AirAsia for 2013 as Zest and PAA forged a tie-up in Mar-2013. For 2012 separate figures for Zest and AirAsia are provided. Tigerair Philippines was formerly known as SEAir. While it will be another month or two before full-year data is available, Cebu Pacific should have ended 2013 with a market share exceeding 50% for the first time in its history. 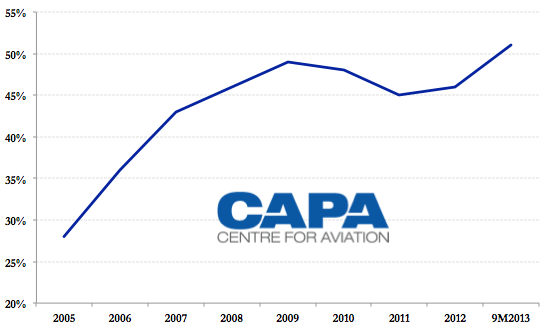 The carrier’s domestic passenger traffic was up only marginally in Oct-2013 and dropped 10% in Nov-2013, reducing the year-to-date passenger increase for the 11M2013 period to 8% with equal 8% increases in seats and ASKs. But the total market was also down significantly in Nov-2013 due to Typhoon Haiyan/Hurricane Yolanda, which forced the closure of several airports for several days. Cebu Pacific has not yet released its Dec-2013 operating figures but the market is believed to have rebounded. Cebu Pacific’s previous high mark for domestic market share was 49%, which it achieved in 2009. The carrier recorded steady gains in market share from 2005, when it completed a successful restructuring, through 2009. The gains came almost entirely at the expense of PAL. Cebu Pacific overtook PAL in 2008 as the largest player in the Philippine domestic market. Between 2009 and 2011 Cebu Pacific’s share dipped slightly as LCC competition increased, primarily from Zest and AirPhil. There was only a slight up-tick in 2012, from 45% to 46%. Cebu Pacific grew domestic passenger traffic by 11% in 2012. But the overall market grew by 10% to 20.6 million passengers as again LCC competition increased – this time with Philippines AirAsia and Tigerair joining an already crowded marketplace. Total domestic seat capacity in the Philippines was up 16%, including 17% at Cebu Pacific, leading to irrational competition. Consolidation in the LCC sector, driven by the Zest-Philippines AirAsia tie-up and AirPhil/PAL Express adopting the full-service model, led to an improvement in market conditions in early 2013. But there were again signs of irrational competition in 3Q2013. Even Cebu Pacific, which has generally been the only profitable Philippine carrier, posted a rare loss in 3Q2013 as its average passenger yield dropped 10%. Competition however was more rational towards the end of the year and the outlook for 2014 is rather bright as Cebu Pacific’s acquisition of Tigerair Philippines leaves only two competitors. As CAPA previously reported, Cebu Pacific plans to complete its acquisition of Tigerair Philippines in late Feb-2014 or Mar-2014. The current Tigerair Philippines operation will be retained by Cebu Pacific – including network, air operators’ certificate (AOC), management team and workforce – but schedule adjustments and fleet changes are expected. Cebu Pacific plans to keep current capacity levels at Tigerair Philippines, which would give the Cebu Pacific Group a further 5% share of capacity in the domestic market. Cebu Pacific however will soon need to cover this 5% using its own fleet as Tigerair Philippines’ current fleet will be returned over the next several months. Cebu Pacific is now working on a revised fleet plan which incorporates the Tigerair Philippines operation. Cebu Pacific tells CAPA it expects to be able to move over aircraft to Tigerair Philippines without impacting its plan to increase domestic capacity by 9% in 2014 under the Cebu Pacific AOC. As a group, total domestic capacity should increase by close to 20% when factoring in the capacity flown by new subsidiary Tigerair Philippines. Cebu Pacific expects to improve aircraft utilisation rates at both AOCs, helping the group achieve its capacity goals despite only increasing the size of its narrowbody fleet by one aircraft. Cebu Pacific currently operates 38 A320 family aircraft along with eight ATR 72 turboprops and two A330 widebodies. The carrier’s single-aisle fleet is only slated to grow by one aircraft in 2014 as five A320s are delivered but four are returned. There will be no changes to the ATR 72 fleet. Three A330s are being added but these are intended for expansion of Cebu Pacific’s new long-haul operation, which launched in Oct-2013 with a daily service to Dubai. Cebu Pacific now plans to shift to Tigerair Philippines four of its A320 family aircraft. The moves will come in phases over the course of 2014, resulting in only 35 A320 family aircraft under the Cebu Pacific AOC at the end of the year compared to 38 currently. But Cebu Pacific points out that it will be able to roughly keep the same number of aircraft in active service. The carrier essentially gains one A320 at the end of Feb-2014 when the aircraft, which has been grounded since a Jun-2013 runway overrun incident in Davao, is returned to service. Cebu Pacific will also soon have three spare aircraft in its schedule – a high figure for an LCC that it expects to cut back on as it looks to free up aircraft for Tigerair Philippines. Cebu Pacific is also looking at temporarily using A330s in the domestic market. While Cebu Pacific plans to use the three A330s being added in 2014 to launch new routes to Australia and the Middle East the carrier has not yet finalised plans or selected a launch date for its second long-haul route. As a result there will be an opportunity to initially use the third A330 for domestic operations after it is delivered in Feb-2014. This will enable higher capacity levels during a peak period and at least temporarily offset the loss of the first aircraft to Tigerair Philippines. There could be further opportunities to use A330s domestically later in 2014 depending on when additional long-haul routes are launched. 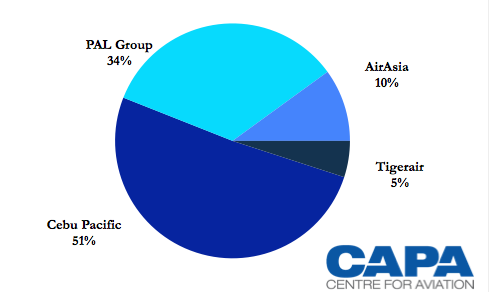 The carrier's fourth A330 is slated to be delivered in early 2Q2014 while the fifth aircraft is slated to come in late 3Q2014. Cebu Pacific believes it will be able to squeeze out a 9% increase in domestic capacity while also pursuing 7% growth in its short-haul international operation. Cebu Pacific is planning major expansion of its Japanese operation in 2014, using available traffic rights recently secured from a new air services agreement between the Philippines and Japan. The carrier also has been looking at serving Fukuoka, Hiroshima, Ibaraki, Okinawa, Sapporo and Tokyo Haneda. Cebu Pacific currently serves 21 international destinations in Asia, but only one in Japan – Osaka. The carrier also plans to significantly improve aircraft utilisation levels at Tigerair Philippines. While Tigerair Philippines’ two A319s will be returned when the transaction closes, Cebu Pacific plans to only initially move over one aircraft as it believes it can maintain current capacity levels at Tigerair Philippines with a fleet of four aircraft – initially one Cebu Pacific aircraft and three inherited aircraft. Tigerair Philippines’ average aircraft utilisation rate is currently less than 10 hours per day while Cebu Pacific’s A320 utilisation rate is about 12 hours. Cebu Pacific will likely look to achieve in 2014 a utilisation rate across both AOCs above 13 hours, which it achieved in 2012. Cebu Pacific now expects to return in 3Q2014 to Tiger Airways Holdings the three inherited A320s. A slight delay is possible although it prefers to transition the fleet as soon as possible for commonality reasons. Cebu Pacific’s A320s are powered by CFM56s while Tigerair uses IAE V2500 engines. For now Cebu Pacific plans to keep a four-aircraft fleet at the Tigerair Philippines AOC. But by 3Q2014 Cebu Pacific will have completed a thorough review of the Tigerair Philippines operation and have decided on potential network changes. If new routes are launched, a larger fleet could be required. As CAPA reported on 9-Jan-2014, Cebu Pacific will initially keep all of Tigerair Philippines’ 12 current routes but will look to re-time flights on the eight overlapping routes to avoid the two carriers operating at the same times. Schedule changes are expected starting with the northern hemisphere summer schedule from the end of Mar-2014. Cebu Pacific could look to make network changes at Tigerair Philippines by the time the northern hemisphere winter schedule kicks in at the end of Oct-2014. Unlike Tigerair, which was at a different stage of development in the Philippines market, Cebu Pacific will not have the stomach to continue operating unprofitable routes. There could be opportunities to pursue new international routes. Having two AOCs gives the group an opportunity to apply twice for newly available traffic rights. Cebu Pacific could potentially use Tigerair Philippines to support the group’s plans for expanding in Japan and apply for rights in markets such as Taiwan, which could ink a new air services agreement with the Philippines in 2014. Cebu Pacific will also eventually consider a re-branding for Tigerair Philippines. The group decided to leave the brand intact for now as it did not see any problems with the brand and did not want to rush into a decision without thoroughly evaluating all the options. But options for evolving the brand will be examined later. Tigerair Philippines has been highly unprofitable, consistently losing the equivalent of USD1 million per aircraft per month. But Cebu Pacific is confident it can quickly turn around the operation. The carrier’s costs will be reduced as utilisation rates improve and as synergies are pursued with Cebu Pacific. Cebu Pacific expects even bigger improvements on the revenue side as it starts to use its own distribution network, including website, to market Tigerair Philippines-operated flights. Tigerair Philippines suffered from significantly lower yields than Cebu Pacific. Under Cebu Pacific, Tigerair Philippines should be able to improve yields and potentially become a profitable operation. With just three players in the domestic market, irrational competition is unlikely to return. But AirAsia should be able to emerge as a stronger competitor as the Tigerair Group exits. While the PAL Group has seen its domestic market share further decline over the past year and no longer has a budget subsidiary, it still often competes with the LCCs on price. PAL and particularly AirAsia could respond by pursuing domestic capacity expansion. But the capacity added is unlikely to approach the approximately 20% being added by the Cebu Pacific Group as a result of the Tigerair Philippines acquisition and further organic expansion. Cebu Pacific will enjoy a big jump in domestic market share for the second year consecutive. The group should easily be able to capture a 55% share in 2014 and could end up with close to 60%, giving Cebu Pacific a powerful grip on the market.